We were able to get a few 08 Topps-related cards signed at the San Diego Padres complex in Peoria at their Spring Training Fan Fest a few weeks ago. 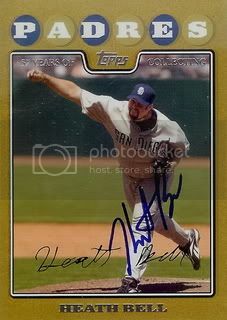 Two-time All-Star closer, Heath Bell signed a Gold Border Parallel card for our collection. Hopefully the Padres can find a way to resign him and keep him in San Diego for a long time.